Instead, a rule of thumb that has emerged in environmentalists’ circles is simply “eat less meat.” This statement frames meat as an indulgence rather than 1) the end result of an essential and timeless ecological process (the biological breakdown of vegetation, which feeds the soil and removes dead grass so that new vegetation can grow) and 2) a fulcrum in the way land across the world is managed or mismanaged. 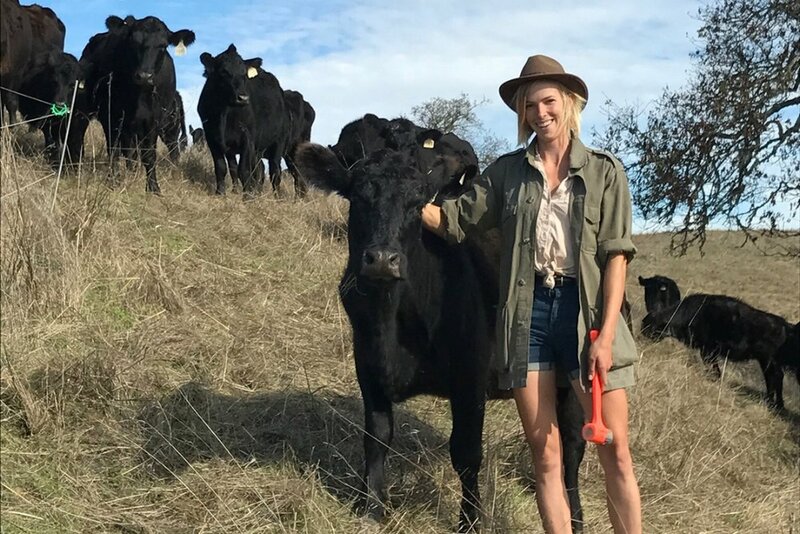 As a grazier and land manager, I’m part of a growing group of people who have committed our lives to restoring the health of environments directly, through exquisitely precise grazing on sensitive land, and who depend on the support of our communities to do this work. “Eat less meat” is a well-intended caveat amongst woke environmentalists (a group who is, after all, my cohort) but it has also become a primary barrier to me and others like me doing our work. And it’s hard to not take that personally. Because what could be more personal than the health of my watershed and the kingdoms that inhabit it? If these things aren’t personal to you, we have a bigger problem. Our work goes like this: We memorize every nook and cranny of a piece of land like a lover’s body. We study how water flows across it and what grasses grow where. We plant trees where we’ve seen them grow before and could grow again. We spend unpaid hours moving animals exactly where they need to go to knock down encroaching brush on long-neglected land. We fence out bird nests. We leave areas ungrazed for a season—and can calculate the cost to the tune of hundreds of dollars—because we know in our throats, our chests, our bellies, and our bones (that’s where we feel it) that it needs another season to grow before grazing would be helpful. We get knocked down, kicked, cut up and cut open; we don’t just risk injury but accept its inevitability. We memorize the names of species that used to grow or live here but have been lost. We love the land and its inhabitants so much that we’re willing to work for next to nothing. But martyrdom isn’t very becoming, and you can’t milk a dry cow; so like everyone else, graziers have to make money. Until environmentalists actually really put their money where their mouth is and pay me and others to graze land right without meat as the chief goal, we have to sell the surplus from our herds (the flesh of some of the animals) in order to be able to afford to feed ourselves. Believe me, I wish I were a photosynthesizing autotroph who could get my nourishment directly from the sun. Not all grazing is created equal. This is the essence of what gets missed in discussions about the impact of livestock agriculture on our local ecosystems and global climate. Decades of mismanagement has left a tough legacy for those of us grazing with restorative goals to overcome. But when animals are managed according to nature’s schedule, beautiful changes can happen fast. Some of the year I graze the animals in tight bunches to lay down old grass to feed the soil. Other times, I’m herding them fast across the property to stimulate grass plants to grow denser and healthier while they pump carbon deep into the soil food web. I can stop erosion around streams based on how I move these big animals, and stabilize vulnerable hillsides through careful decision-making. For me and many like me, grazing is our art form—it’s our best tool for breathing new life into neglected land. “Eat less meat” is about mitigating damage, and it misses the opportunity to tell people that there’s a way to actually benefit their planet. Industrially produced meat is unquestionably bad for the environment, and for animals. But perpetuating the myth that all meat is the same means that the potential benefits of responsibly raised meat never get a sufficient foothold. By telling only half the story, we’re perpetuating the problem because we never bother to mention the solution. As an aside, few environmentalists who are opposed to grazing animals and eating their flesh have demonstrated either the degree of embodied affection, personal risk, and deep practice or the knowledge of grassland dynamics, plant succession, and wildlife movement that I’ve seen among the graziers in my life. So I urge those who care about the meat industry’s impact on the environment to bring more curiosity and humility to the discussion. When we say “eat less meat” and end it there, we miss an opportunity to equip eaters with the means of sourcing protein that will not only nourish them but restore their home ecosystems. And behind every few hundred acres of land that goes poorly managed due to consumer miseducation is a land steward who can’t do their work. Appetite is energy. Rather than try to halt the tide of appetite for meat by discouraging its consumption outright, a better way to steward that energy would be to concentrate on where it would it can do the most good. In doing so, we’re not just improving our environment, we’re widening the demand for graziers who can produce meat and serve as ecological service providers. So don’t “eat less meat.” Eat meat from people whose hands you can shake and whose ranches you can visit. Eat as much of that as you can afford, because that stuff comes from extensive production systems that impact hundreds and thousands of acres. 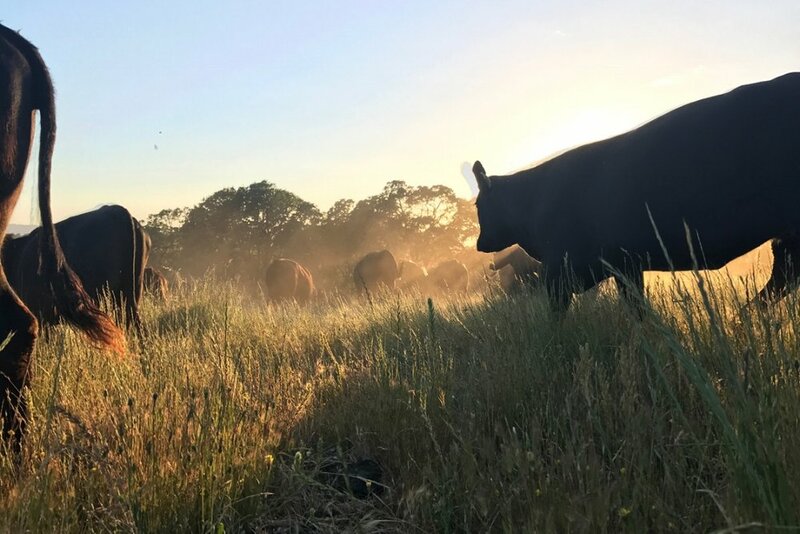 Sourcing your protein from places you can account for means you can verify that their pastures are also habitat for foxes, badgers, burrowing owls, and bears—that you are keeping land wild and free. As I see it, beef raised in its environs beats a bean field any day as an ecologically just source of protein. This type of meat isn’t cheap—and you might find that you value it differently and stop taking it for granted. The end result may very well be that far less meat is consumed overall, at least for a while. But the quantity doesn’t matter to me—what matters is what that animal did in its life on earth. We have to pay for the world we want to live in. This means consuming the flesh of other sentient animals may damn well require a line-item on our budgets, alongside “eating out” and “entertainment.” Maybe it’s time we socialized ourselves and others to budget for environmental activism, and use that money to buy meat produced by the soil-building, grassland-loving graziers in our communities.